In the current society, rocking a tattoo has been the recent trend for many men out there. Though different men rock different tattoos for different reasons, the main meaning behind these tattoos remains a mystery to many tattoo lovers. The good news however lies in the fact that, tattoo experts and designers have come up with different meaning to describe certain tattoos. 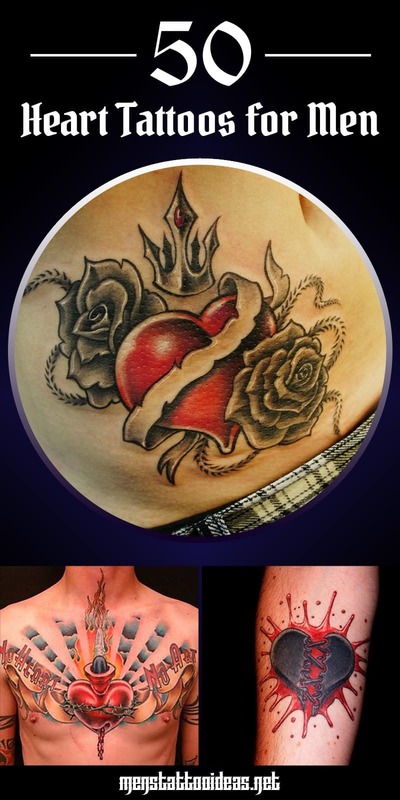 Though different tattoo designs are available to choose from, the all too common heart tattoo takes the bragging rights. Heart tattoos for men come with the same heart or love shape with the difference being the extra features present on the tattoos. The following are the common heart tattoos for men and their meanings. During the ancient times, the Celtic people were known for their strength and unity. The Celtic heart tattoo simply means strength and unity. The man rocking the tattoo may happen to be a bouncer or a guy who loves unity. Unlike the common heart tattoo, the Celtic heart is made up of 4 different patterns namely crosses, knots, step work and spirals. These types of tattoos usually consist of a heart and a lock. This simply stands for undying love and affection. The person at whom the tattoo was drawn for is the only person who can unlock or open the lock. A flaming heart tattoo signifies a burning feeling which in this case is love. The man rocking the tattoo can be described as a passionate man who has a great feeling towards his better half. The tattoo is usually drawn as the normal heart. The only difference is that, fire flames are included at the top most part of the heart. 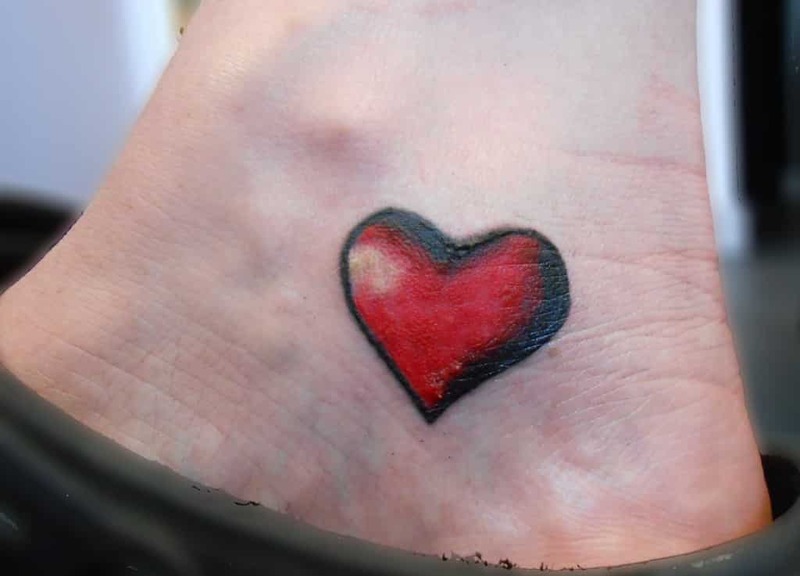 As the name suggests, the broken heart tattoo simply signifies a broken heart. The man wearing the tattoo might have gone through a difficult period in his life such as losing a loved through relationship breakups or death. The tattoo simply indicates the guy is sad in one way or another. The winged heart tattoo is basically a heart tattoo with wings on it from both sides. These types of tattoos symbolize freedom and free spirit. Men who usually rock these tattoos may have been subjected to certain things that prevented them from living their lives to the fullest. Perhaps it might have been a jail sentence or a drug addiction. A stitched heart tattoo is a type of tattoo that comes with visible stitches either around the entire heart or at specific parts of the heart. These tattoos simply signify some sort of pain the man went through during a time in his life. The tattoo may also signify a healing process that the man is undergoing at the hands of another person. Color black as we all know symbolizes a dark experience whether in the past or the present. 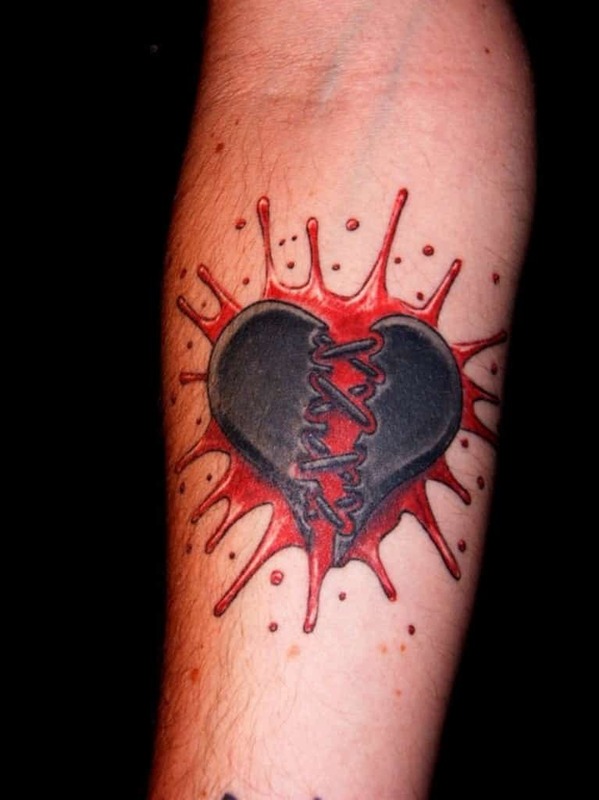 The tattoo is used to represent the loss of a loved one just like in the case of the broken heart tattoo. As a clear indication for their loss, many men also include wings on these black heart tattoos. This is a simple tattoo and a great idea for a small tattoo on the wrist or ankle. The image is a heart that is well shadowed and reminiscent of childhood memories. This heart tattoo can represent anything as you will make it unique. This large tattoo is great for the back or chest. It has intricate details which depict the heart as a hot water bottle. The heart is constricted by barbed wire and bleeding. On the other hand, the rays in the background are positive and show shadows of clouds and fire. With the words “No heart, No art”, it sends its message. This heart tattoo is drawn in a true comic style. 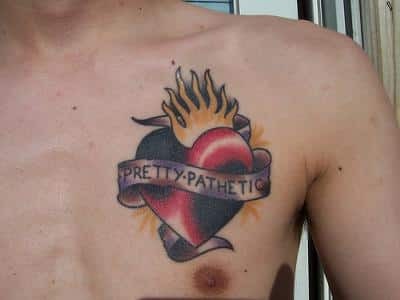 This great tattoo idea also has a sense of humor with the words “Pretty pathetic”. The words are written on a metallic banner across the heart. Naturally, you can choose your own words to make this heart tattoo for men even more unique. 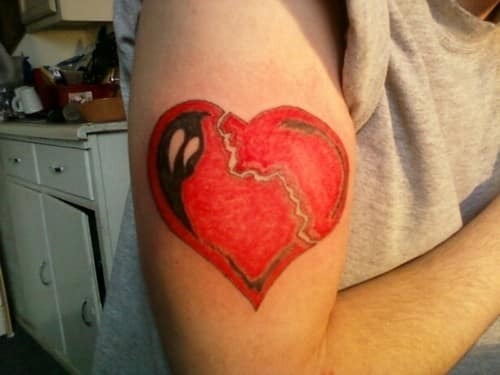 This vibrant red tattoo represents a broken heart. It has a comical ghost-like figure to one side that may also be perceived as a regular shadow. The coloring technique makes the tattoo appear drawn on with a felt tip, although it is an actual tattoo. This tattoo idea is also unique because the heart breaks to the side and not in the center. 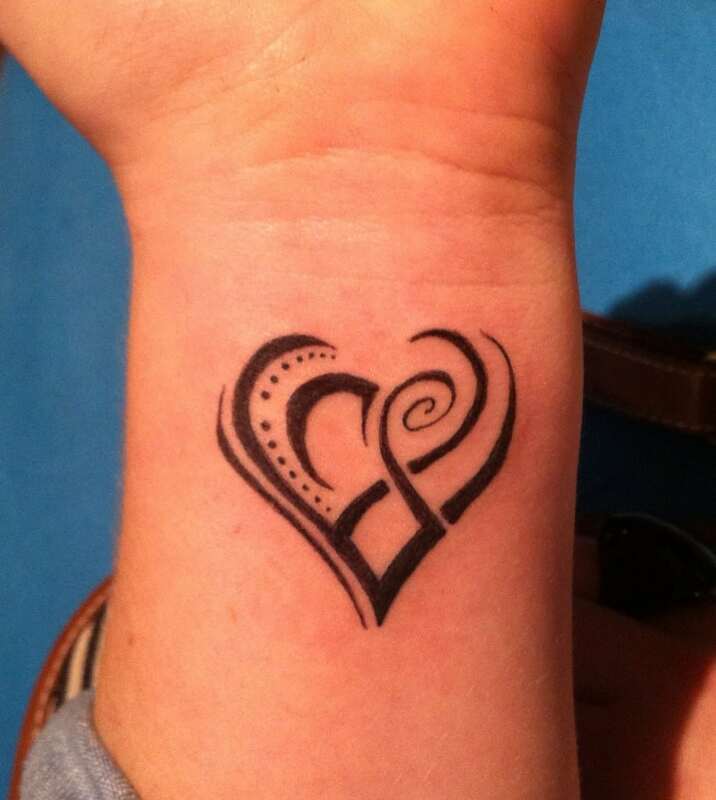 A tribal-inspired tattoo of the heart. It is all black with solid lines and dots. This heart tattoo design is perfect for the wrist, shoulder, arm, or even leg. The tattoo doesn’t fully come together to form a heart. Rather it makes a shadow of a heart which is very symbolical. 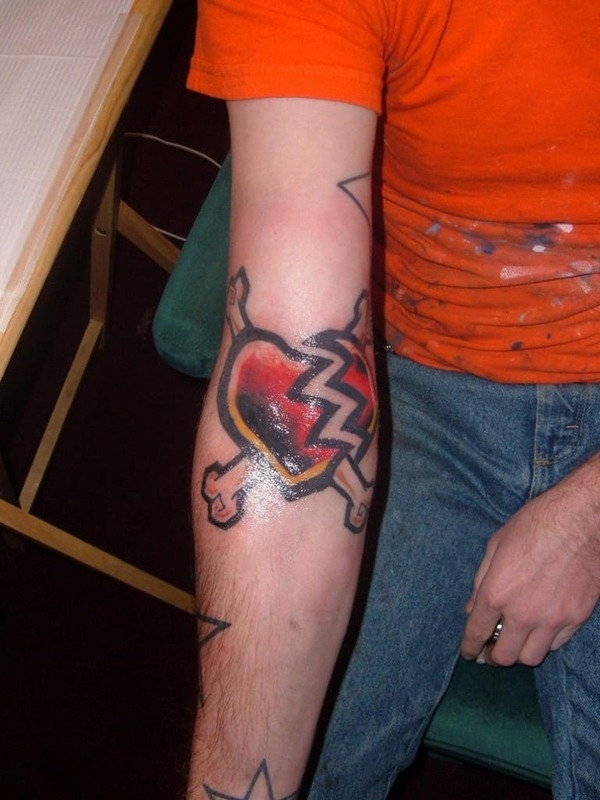 This graffiti-like tattoo takes the image of a pirate flag and replaces the skull with a broken heart. 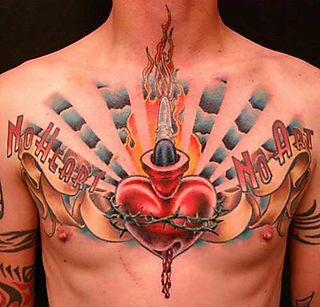 Done in vivid colors, it is a great idea for a men’s heart tattoo. While the lines are solid black, the yellow and red colors blend into each other. This gives the tattoo an added special effect. This black heart is ripped and bleeding. The image of the heart is then sewn together. This heart tattoo idea has great meaning as well as art. The great shading work makes the men’s tattoo appear 3-dimensional. A great piece for any part of the body. This simple arm tattoo holds a great message. The words “Things that are broken are meant to be fixed” go across the arm to the broken heart. The tattoo is created as if the words are the string that brings the heart back together. A powerful message and a great men’s tattoo idea. This classic “I love mum” tattoo has a twist. 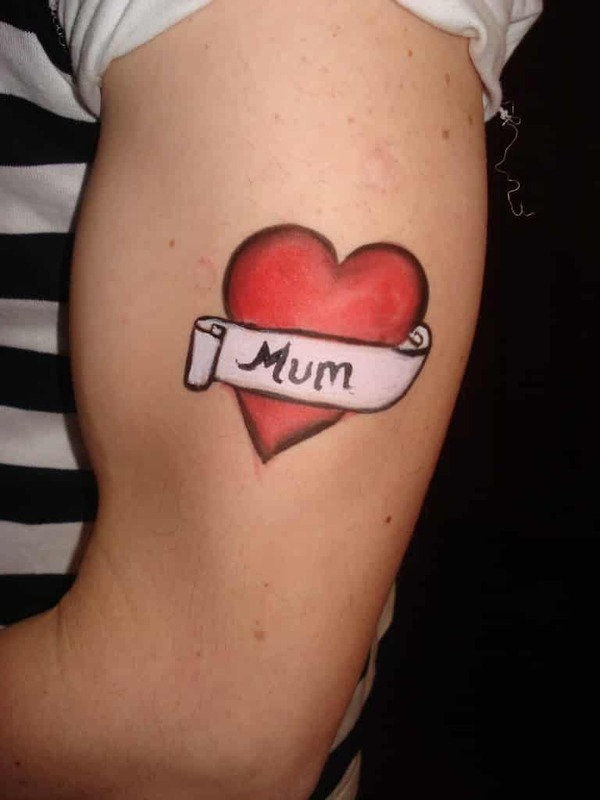 It has the standard image of a heart with a banner across it that reads “Mum”. However, if you look closer you may notice that it appears painted on. This special technique makes the arm an actual canvas for an oil painting. This intricate black and white tattoo is done with many details. The heart is bright red which makes it stand out. 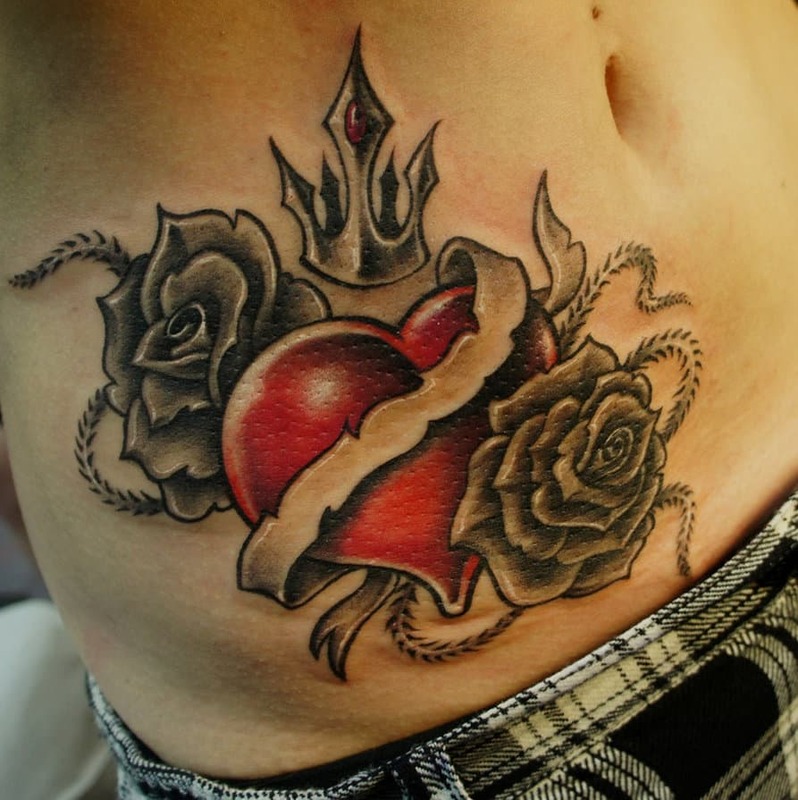 The shading gives the heart, roses, and crown a realistic appearance. A great heart tattoo idea for the chest, back, or shoulder as it is large.